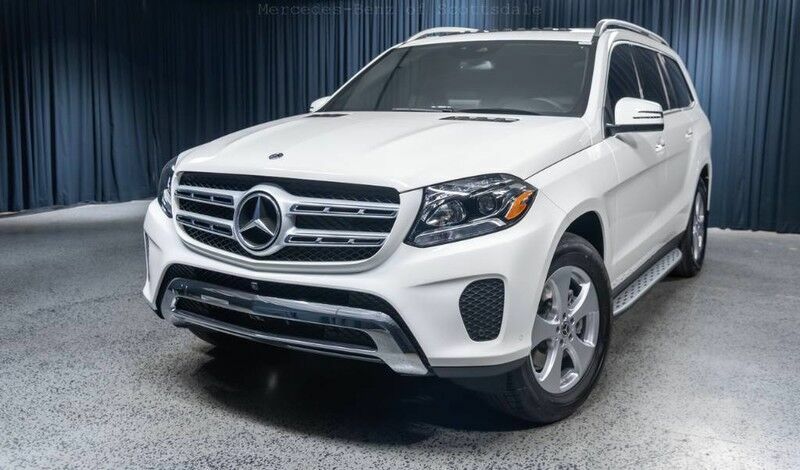 Contact Mercedes-Benz of Scottsdale today for information on dozens of vehicles like this 2019 Mercedes-Benz GLS GLS 450 4MATIC. This Mercedes-Benz includes: POLAR WHITE PREMIUM 1 PACKAGE Keyless Start Smart Device Integration HD Radio Navigation System Seat Memory Satellite Radio Power Door Locks Keyless Entry Hard Disk Drive Media Storage MP3 Player ILLUMINATED RUNNING BOARDS Running Boards/Side Steps BLACK, MB-TEX UPHOLSTERY Premium Synthetic Seats LANE TRACKING PACKAGE Lane Departure Warning Blind Spot Monitor HARMAN/KARDON LOGIC7 SURROUND SOUND SYSTEM Premium Sound System AIR IONIZATION W/AIR FILTER PARKING ASSIST PACKAGE Automatic Parking Back-Up Camera *Note - For third party subscriptions or services, please contact the dealer for more information. * Want more room? Want more style? This Mercedes-Benz GLS is the vehicle for you. Pull up in the vehicle and the valet will want to parked on the front row. This Mercedes-Benz GLS is the vehicle others dream to own. Don't miss your chance to make it your new ride. This Mercedes-Benz GLS GLS 450 4MATIC comes equipped with all wheel drive, which means no limitations as to how or where you can drive. Different terrains and varying weather conditions will have little effect as to how this vehicle performs. Enjoy the drive without worrying about directions thanks to the built-in navigation system. This outstanding example of a 2019 Mercedes-Benz GLS GLS 450 is offered by Mercedes-Benz of Scottsdale. This SUV gives you versatility, style and comfort all in one vehicle. Today's luxury vehicle is not just about opulence. It's about a perfect balance of performance, comfort and attention to detail. This 2019 Mercedes-Benz GLS is the perfect example of the modern luxury. Few vehicles can match the safety and comfort of this AWD Mercedes-Benz GLS GLS 450. With enhanced performance, refined interior and exceptional fuel efficiency, this AWD Mercedes-Benz is in a class of its own. This is the one. Just what you've been looking for.